Article 8: The Chase Bank Miami (CBI) Correspondence of Mexico Exporta Definitives The Mexico Exporta series has a very large number of issues (approximately 100), and of varieties (in the neighborhood of 500). Here are a few of the issues in a bank correspondence to Miami. The article includes web pages dedicated to the 1000, 2000, 3000, 4000, and 5000 pesos values. I have dedicated a section of this web site to this fascinating series. Article 29: Mexico Exporta 5000 Pesos: The Printings I continue to describe the Exporta high values from the Chase correspondence. 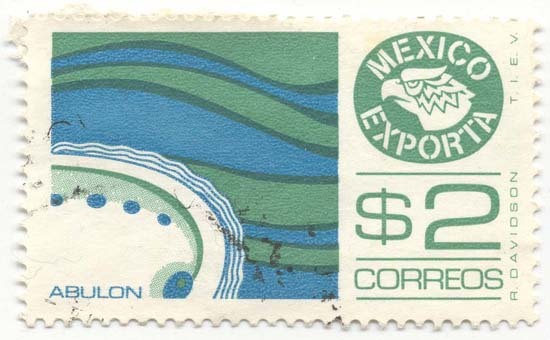 Article 34: Major Printings of the Mexico Exporta Tequila 10 Pesos I show four distinct color varieties for this stamp. Article 92: Mexico Exporta 20 Pesos Forged Iron (Hierro Forjado) There were several printings of this stamp. I show here examples from some of the printings, as well as details from one of the stamps showing a plate variety. There are three major groups: the gray black printings, the slightly doubled gray printing, and the black printing. Because of the changes brought about by inflation, this stamp was used as a low value and as a high value. Article 117: Mexico Exporta Abalone, Wires, and Trucks types I show here three major Exporta types. Quick links: motor vehicles, abalone, and electrical wires, and pages highlighting the color varieties of the abalone, and electrical wires types. Article 384: Exporta first attempt at examining the papers These are the stamps that were issued on only one paper.